Adventurous Caribbean and Bahamas yacht vacation aboard Explorer Yacht GLOBAL by Shadow Marine – Superyachts News, Luxury Yachts, Charter & Yachts for Sale. If adventure is what you are seeking then look no further! A Caribbean and Bahamas yacht vacation aboard explorer yacht GLOBAL by Shadow Marine will turn into one huge adventure filled with memories to last a lifetime. Motor yacht GLOBAL (ex Allure), a fantastic 67m sport-utility vessel, can be used as a primary charter yacht, or as a mother ship for an additional superyacht with specialized water toys, a helicopter deck and extra staff. The yacht represents a spacious exploration vessel with accommodation for 12 charter guests and the elegance typically reserved for mega yachts. Charter yacht GLOBAL offers five vast decks for entertaining, socialising as well as storage for the countless toys and equipment. The four upper decks provide expansive areas to unwind and get together with friends and family, as well as the accommodation in six deluxe staterooms. Designed with safety and pleasure in mind, the 67m super yacht GLOBAL (ex Allure) by Shadow Marine also offers great functionality, versatility, elegance, luxury, practicality and seaworthiness. She is a purpose-built sport utility vessel with accommodation for twelve charter guests in deluxe facilities and exceptional service aboard. All of the guest staterooms come with en suite facilities, they are inviting, spacious and have their own private balcony. Fantastic views of the surroundings are provided by the large oval-shaped windows right through the main deck, the accommodation deck and skylounge deck areas. 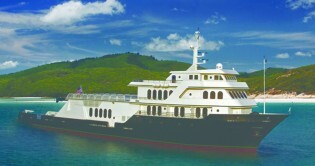 The accommodation aboard Global includes one master stateroom, which features a queen size bed, a bath tub and a shower. There are further four guest cabins, each with a queen size bed, a shower and a bath tub, as well as one cabin with an upper / lower bed configuration with a shower and a bath tub. The entire yacht is fully air-conditioned. GLOBAL superyacht is helicopter capable and is well-suited for commercial filming or documentaries, as well as dockside displays of cars or boats etc. In addition there is a fantastic space aboard to entertain large groups dockside on either the helicopter landing deck or in the climate controlled, two story hangar, complete with raised DJ balcony, sound system and mirrored disco ball to create the perfect setting! The bridge deck is another fabulous place for charter guests to unwind, enjoying the 28ft (8.5m) freshwater pool or relax sunbathing. The pilot house is equipped with large panoramic windows and wing stations to offer unobscured visibility, and is also home to the Captain’s cabin. The pilot house is equipped with top navigation systems, Sentinel Bridge monitoring, INMARSAT Fleet 77, thermal imaging camera and three 23 inch (58,4cm) flat screen displays. There is an abundance of water toys and equipment aboard GLOBAL explorer yacht, which includes the 28ft Nautica catamaran hull landing craft, a Contender centre console outfitted for fishing, four wave runners, four kayaks, two Laser sailboats, six underwater scooters, snorkelling gear, ample fishing gear, towable toys, water skis as well as boards. Of course other equipment could be accommodated. Global’s lower deck combines serviceability with crew comfort. The professional and highly attentive crew of 13 is accommodated separately with own heads and shower in the separate crew quarters. Lovely beaches, beautiful warm shallow waters and inviting locals is what awaits you after setting off on the Bahamas yacht charter vacation of your lifetime. The Bahamas is a renowned paradise on Earth with its spectacular white- and pink-sand beaches and over 2000 fantastic islands and cays to explore. Perhaps the most famous beaches to visit on your Bahamas charter yacht is the Treasure Cay Beach in the Abacos, the Gold Rock Beach on Grand Bahama Island, Cape Santa Maria Beach on Long Island and the Harbour Island Beach. Passionate divers will find countless destinations for diving around The Bahamas. There are the sunken Spanish galleons, island blue holes, underwater caves and forests-like coral reefs full of incredible underwater life. For more adventurous, there is a possibility to swim with reef sharks! Bahamas is also home to the largest colony of pink flamingos, the endangered Bahama Parrot or the unique Andros iguana. The islands are also popular with fishing enthusiasts, with numerous fishing possibilities. Following a relaxing day full of water activities and relaxation, Bahamas offers fantastic night time entertainment. Various islands offers quaint bars playing traditional Goombay, Jankanoo or Rake & Scrape music, but you will find up-scale New York-style nightclubs as well as lounge bars. For souvenir shopping, visitors on a Bahamas mega yacht charter will come across lovely shops with local craft, jewellery and other authentic Bahamian items. There is something for everyone: including stylish boutiques, large retail centres as well ask local open-air markets. The Grand Bahama Island, the Abacos, Bimini, the Berry Islands, Eleuthera & Harbour Island, Andros, Nassau & Paradise Island, The Exumas, Cat Island, San Salvador, Rum Cay, Long Island, Acklins & Crooked Island, Mayaguana, Ragged Island, Inagua. We will provide you with additional information as well as help you create your own personalised itinerary, based on your desires and dreams.